Étude no. 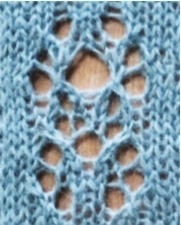 6: vertical symmetry in lace. 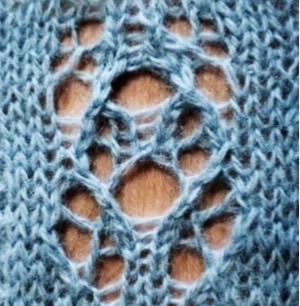 A free stitch pattern. I’ve been wanting to work on my ability to make lace appear vertically symmetrical as well as horizontally for a while now. It turns out that it’s trickier than you might think. Thank you for all your kind suggestions (on my blog, on Ravelry, on G+) about an abbreviation for the unusual double decrease. For this post at least, I’m going to use LRC, from this fantastic and comprehensive discussion of decreases. (LRC stands for Left-Right-Center, and describes the order of the three stitches in the decrease, from front to back.) 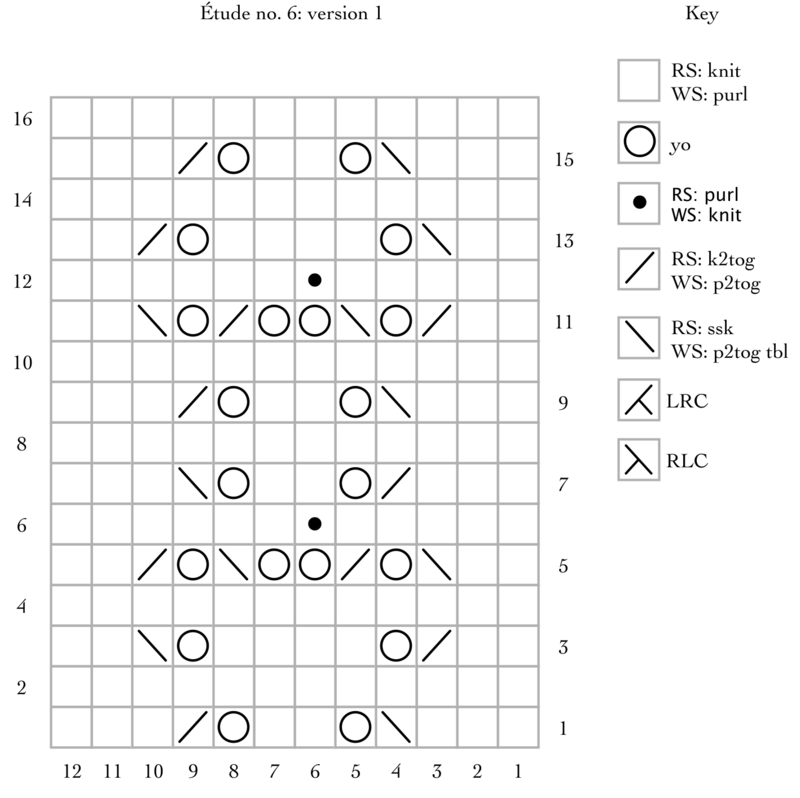 I am therefore going to use RLC for sl 1 — k2tog — psso. This is the motif I’ve turned into lace. I don’t remember where I got it, but it’s not secret code. LRC: ssk, slip decreased stitch back to left needle, pass next stitch over, slip finished stitch to right needle. RLC: slip 1 knitwise, k2tog, pass slipped stitch over. The obvious place to start was by pretending that decreases can be mirrored vertically, just to see what happened. I’ve put two stitches on either side as a frame, but columns 1, 2, 11, and 12 aren’t part of the motif. 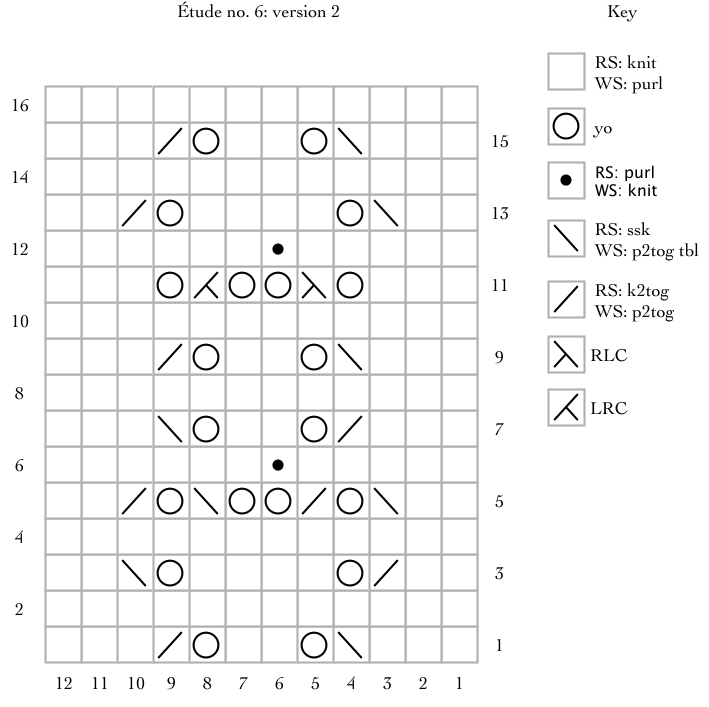 Row 3: k2, k2tog, yo, k4, yo, ssk, k2. Row 5: k2, ssk, yo, k2tog, yo x 2, ssk, yo, k2tog, k2. Row 6: p6, k1, p5. Row 7: k3, k2tog, yo, k2, yo, ssk, k3. 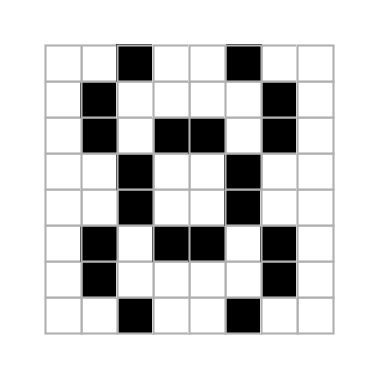 Row 11: k2, k2tog, yo, ssk, yo x 2, k2tog, yo, ssk, k2. Row 12: p6, k1, p5. Row 13: k2, ssk, yo, k4, yo, k2tog, k2. Row 15: Repeat row 1. This is an attractive result, but the decrease line on either side of the double YO on row 11 isn’t heavy enough. Row 11: k3, yo, RLC, yo x 2, LRC, yo, k3. This is getting closer, but the space in the middle on rows 13 and 15 isn’t quite right yet. The double decrease on row 5 popped up between two stitches, so I need to make the double decrease on row 11 disappear into two stitches on row 13. Row 13: k3, yo, k1, ssk, k2tog, k1, yo, k3. Row 15: k4, yo, k2tog, ssk, yo, k4. 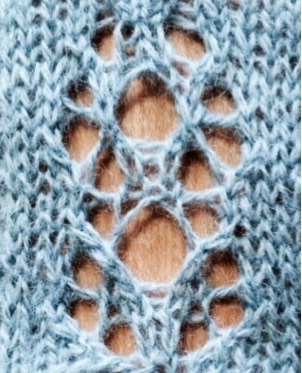 knitting stitch pattern: Étude no. 6 by Naomi Parkhurst is licensed under a Creative Commons Attribution 4.0 International License. < Do you know this non-standard double decrease? Abbreviation needed.